The second-year Pecos League has announced that the expansion Santa Fe Mountain Lions will begin play in 2012. A final agreement to use Fort Marcy Park is apparently still pending. The city council is scheduled to address the contentious issue of beer sales at a meeting on Tuesday, November 8. 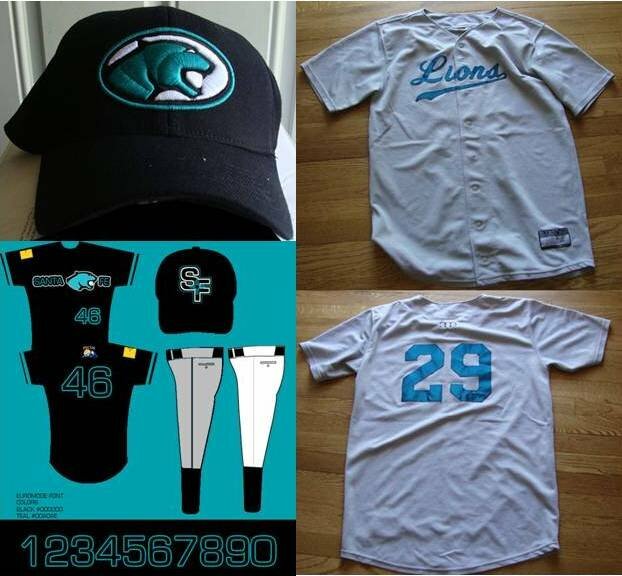 The primary logo used for the team is the recycled black and teal lion logo used for the proposed Desert Valley Mountain Lions from the defunct Continental Baseball League. Read more here. The Pecos League has been bombarded with questions from citizens, fans, critics, and everyone else who has a 505 area code. This beer issue has really taken off and people are either on one side or the other. The Pecos League of Professional Baseball Clubs wants a to play baseball in Fort Marcy Park in the Summer of 2012 in Santa Fe, New Mexico. Santa Fe happens to be one of the political cities in the United States, very different than any town in the entire Pecos League Region. The citizens of Santa Fe and the leaders of the city of Santa Fe are very familiar with the Pecos League and the benefits the league has brought to other New Mexico Cities. The Pecos League is not asking for $500,000 to bring a team in, we are willing to accept Fort Marcy in current condition and grow with the team and the league. The Pecos League obviously wants to be in Santa Fe to increase exposure of the Pecos League and to bring family entertainment to Santa Fe, a city that actually needs it. “This should be expected in Santa Fe, political debates are the norm. If they get beer passed this could be a big event, Fort Marcy can be perfect for this league.” says Las Cruces Vaqueros General Manager Miguel Salcedo, who was born and raised in Santa Fe. Miguel has also been with the Vaqueros since the team was formed in 2009 and sees great potential in Santa Fe. Will Webber is the person that got the ball rolling with the Santa Fe Team. He was the man who spearheaded talks between Robert Romero, Ronald Trujillo and Andrew Dunn. The Pecos League tried to put a team in Santa Fe in 2011 and begged Santa Fe for an exhibition game in the 2011 season when Ruidoso played Roswell in Clovis and in Pueblo. Andrew Dunn went to Santa Fe twice. Originally the two teams were supposed to play at Fort Marcy and made the Pueblo game a doubleheader and moved another game in the series to Roswell. Barbara Lopez with the Santa Fe Parks and Recreation Committee said the field was not available under any circumstances. The facts were the field was sitting idle and was used as a backup field for an AABC League. In an interview with Will Webber last week Pecos League Commissioner Andrew Dunn stated that he wanted to play in Santa Fe no matter what for the 2012 season. The purpose of the interview was to announce the hiring of Bill Moore. This rattled leaders of the city and the city council as they are trying to get votes so alcohol can be passed. Many people read the article and took it that the Mountain Lions were coming to Santa Fe no matter what. Well Mountain Lions are very mobile animals and can be a very mobile team. If the situation is not right the Mountain Lions can move to one of many cities within the region. The Pecos League wants the Mountain Lions to play in Santa Fe. There are two swing votes that can go either way. Current Vote count is believed to be 3-3, if the swing votes split the tie is broken by the Mayor. Many people would love for this to happen to put pressure on the Mayor. The conversation that keeps coming up is the hockey team the Santa Fe Roadrunners, the Roadrunners were a minor league hockey team that failed because they didn’t sell beer. They played out of the Genoveva Chavez Community Center in Santa Fe. The team lasted 3 years but didn’t sell beer and ultimately moved to Topeka, Kansas. The Pecos League and NAHL Hockey League have absolutely nothing in common. The NAHL Hockey League had huge long expensive road trips such as all over Texas, Springfield and Texarkana. Hockey dried up all over the South after the NHL Strike. The Roadrunners didn’t have beer, but in their defense Santa Fe has no connection with the game of hockey, there is no heritage or connection. No one in Santa Fe grew up playing hockey that is for sure. Baseball is a different story. Many Santa Fe natives are huge baseball fans and the game has been in Northern New Mexico for generations. And when the Mountain Lions take the field they will be playing against much closer opponents that people actually know such as Las Cruces, Roswell, Alamogordo, Trinidad and Alpine. The Pecos League is New Mexico Based and has three others teams in New Mexico and Santa is in the center of the footprint.